A 19-year-old’s firsthand account of the war-crimes trial of a guard at Auschwitz/Birkenau. In 2015, a Canadian university student witnessed the war-crimes trial of Oskar Groening. Lebowitz, that student and the granddaughter of survivors, has partnered with Kacer (I Am Not a Number, 2016), herself the daughter of survivors, to give her account. 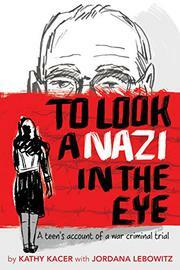 Jordana joins a group of Canadian Auschwitz survivors traveling to Germany to testify. Facing 94-year-old Groening, Jordana’s new friends describe the cattle cars and the selections that separated them from family members headed for gas chambers and the crematoria. One witness, a survivor of Josef Mengele’s twin experiments, testifies to the medical experimentation to which she was subjected as a 6-year-old. Groening, tried not for firsthand murder but for enabling the Nazi death machine, is a prime example of the banality of evil. To Jordana’s surprise, she meets many Germans dedicated to correcting the sins of the past, including a tour guide who explains, “my generation…want[s] to take responsibility for our country’s past”—a good lesson to model for readers from other countries, perhaps. Kacer has reconstructed testimony from news articles and interviews, footnoting sources throughout; the telling is straightforward, relying on content for its impact.